I replied to a post a few months ago now saying that I would love to help out beta testing a game that was unusual. It is a universal RPG but had a piece of software that had been developed with it that would help the GM and players by enhancing the game innately. The Beta was a demanding schedule, I started late and soon realised that there was no chance, with my schedule, to keep up with the needs of the Beta. 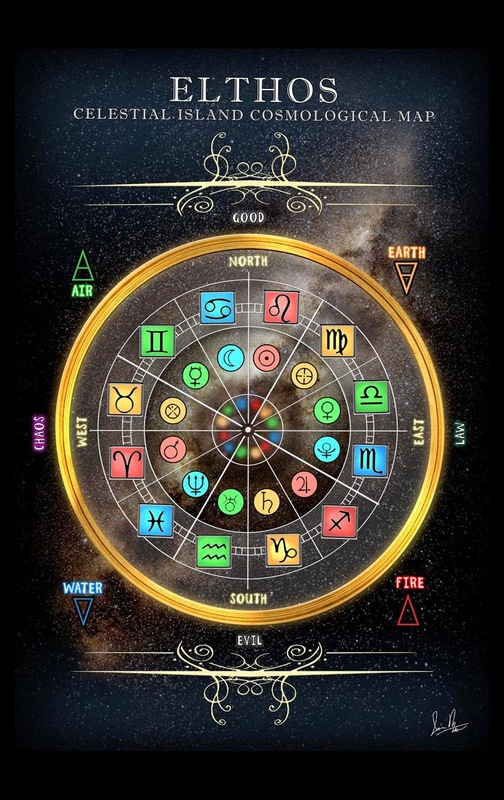 The author (of the game and software – Mark Abrams) was also seeing this across many of the participants and so changed his tack on the beta and opened it up to an open Beta test so that he can get many testers, who will find those bugs at their own pace and the updates can go ahead. 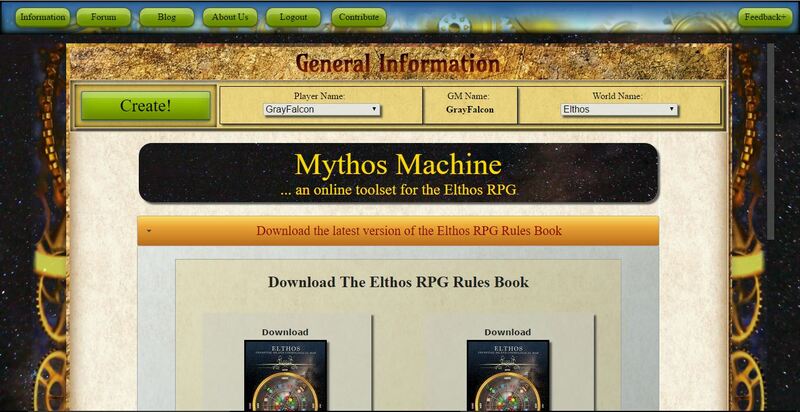 The game is Elthos Role Playing Game and the Software is known as the Elthos Mythos Machine. The entire thing is in open Beta and as such you can sign on and register and grab a copy of the rules. I would suggest that you do this in an effort to help Mark Abrams thoroughly test the Mythos Machine – but more on that later. The current rule set is available for download once you register and log in at the portal for the game and software. The rules started at version one and quickly escalated to version 8 which is where it currently stands. Elthos is designed to be a Universal RPG that the GM uses to apply to his own worlds. As an example the book takes a fantasy styled look throughout so that flavour can be added to the text and examples making them a little more interesting. 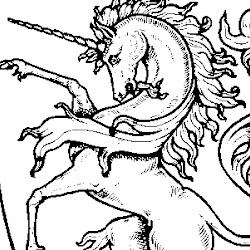 There are also sketches of the world that is presented which are wonderful in breaking up the text as it is not really a standard fantasy setting. Creatures riding dragon flies and the like make it really nice evocative art in a sketched style and I really liked the intrusions it made on my reading. The system uses a One Die System (ODS), that is a D6 system. Any resolution, as a standard rule, has you rolling a d6 against a target number determined by the task resolution table. For example, if I were to try and poke you in the eye, the Task Resolution Table looks at my “Poke in the Eye ” skill and your “Defence Skill” and gives a number that I need to roll on one die. It may also tell me that I am too good in the art of poking in the eye and automatically hit, or you are too good at defence and I don’t even have a chance. It is a simple mechanic and worked well here. This is an extensive discussion about it in the rule book that shows the depth that the author has gone to in considering it. But of course the author knows that there are people out there that like rolling dice and so he has also opted to implement other systems that can be used as alternates from 2 to 4 dice resolution tables. This is a nice touch, but not entirely needed, although I am sure there are people out there that will make use of it. In reality the ODS has the same effect as multiplying the dice out and is the simplest option. That is one of the funny things about RPG’s though, the simplest is often not the option that gets chosen. Some of the reading in this book is hard going. Dense text that are trying to explain and justify the use of the rules often left me having to reread a passage or two and on one occasion asking Mark what it actually meant. This is a minor criticism though as this problem does not often materialise while you read, just every now and again. The entire book is an example of how this system can be used, the real value is the system itself. It talks about building a character and then gives the classes (it is a class based system) that any standard fantasy setting would give. Now, when I review a Universal system I always have a setting in my head that I ask myself “Can it do that?” Now in the case of this book that looks at traditional fantasy it would not fit but the discussion is always talking about how this is an example and how you can do the creation yourself and I can clearly see a way of me doing a post-apocalyptic sci-fi western that I was thinking of as I read it. It would take some work on my part, but if you are not prepared to do work you are probably not looking at a Universal system as a GM. Normally when I do a review of an RPG or a piece of software I do one or the other. This is the exciting part of Elthos. It has an entire game support/campaign support system built right alongside it. It is rare these days to find this occurring. It is normally a third party creating an app that fits a system or a generic app that fits multiple systems. The truth about the Mythos Machine is that it fits seamlessly with the Elthos RPG. If you want to play the setting that is in the book itself there is very little to do. If you want to create your own world there is a little more to do but it is really made wondorously easy by this bit of software. And just between you and I, if you wanted to use the Mythos Machine to record a campaign that did not use Elthos as the base system, it would work. Logging into the Mythos Machine I did not know what to expect. The website is dated in appearance and the system prompts look fairly basic at the start. I followed along several of the tutorial videos that Mark has done and loaded to YouTube. He has a beautiful skill based system ordered at the bottom of your main login page to see where you are up to in your videos and what you should watch before you get to x skill. These videos are well done and in the case of several of them they have been updated during the Beta. There are two modes to the Mythos Machine, one as a player and one as the GM. I logged in as a player to start with and made a character. The system worked OK but the interface was a little clunky. Not having people to play a game with had me a little behind the Eight ball but I could see this was a useful tool as a player. Interacting with information from the world and recording the character, not to mention managing any formula that are required is a great thing for a player. But the magic in this system is not in the player controls. The brilliance of this system comes when you nip over to become a GM and the entire Universe of possibilities are offered up to you to play with. That may sound like a stretch, and it probably is, but the modular system that has been built into the Mythos Machine to create your world and campaign is utterly breathtaking. Mark has truly thought through every portion of this and has shown a level of understanding about what GM’s play with (or want to play with) and intuitively added them. The interface is still a little on the clunky side but this tends to be the truth of all database systems. I started playing about with this interface to make my post apocalyptic sci-fi western and I had to catch myself. I was having way too much fun and I was going down the rabbit hole of building a campaign that I loved and would never play. I called it Captivity and first I played with the base rules system changing it so the players only got on roll of their stats. I added up the world and then I went into skills and did some modification and then I was headed to armor when I realised that I was about to chew up a massive part of my life customising this system. I can only say with the utmost confidence that this is a brilliant and easy to modify tool that does everything and more that the Elthos RPG says it can do. It allows you to play with practically everything at a granular level. You can map out complete campaign arcs, one off adventures, characters, NPC’s, the magic system or psionics or whatever you want to do. It allows you to quickly and easily build classes and introduce them and it all flows so seamlessly with each other. I am a programmer, with a big degree to show it and I am stunned at the amount of work that is laying in this application. It will be a tool that inventive GM’s will quickly learn and love using but the true beauty of it may not be apparent to everyone. This is a shame because I have seen some apps created by teams of people in the past that are just nowhere as elegant as this system. This game and system are in Beta testing phase. It is an open Beta too so I think that if you can, join up. Help Mark refine this system to the best it can be. If you can keep him informed of what works well and what is a little clunky in the rules as well as the system then this game has a very bright future. For me, as it stands at the moment Elthos the RPG is a nice little system that is well thought out and obviously a work that the author has thoroughly thought out and it is a labour of love. He discusses it being a little based in the 70’s and 80’s games but I really feel that it has a level of originality in it. For me it is a good system and a very workable system but with the way the book is written it may put off people who do not know where to start in running their own desired game setting. It possibly could also do with a dedicated GM section too. The real winner here is the Mythos Machine. I can literally not think of a system that works so seamlessly together. It still needs a bit of work on interface and usability but it is so powerful that I am saying you should sign up to the Beta right now just for this! All the things you wonder how you will do works brilliantly through this application and allows you a marvelous amount of power in building your own game worlds. 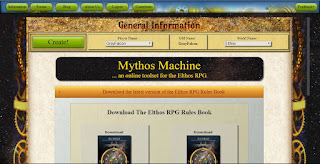 Get to www.elthos.com, download the rules and log on to the Mythos Machine – you will not regret it! Many thanks to Mark Knight for this absolutely lovely review!